As the weather gets colder, many of our customers look out to their backyard, see a pool covered and closed up for the winter and they dream of warmer days just around the corner. We believe that it’s fun to dream about “what if”. What if that pool could be open all year long? The good news is that it isn’t just a fantasy, but can actually be a reality if certain design considerations are taking into account. 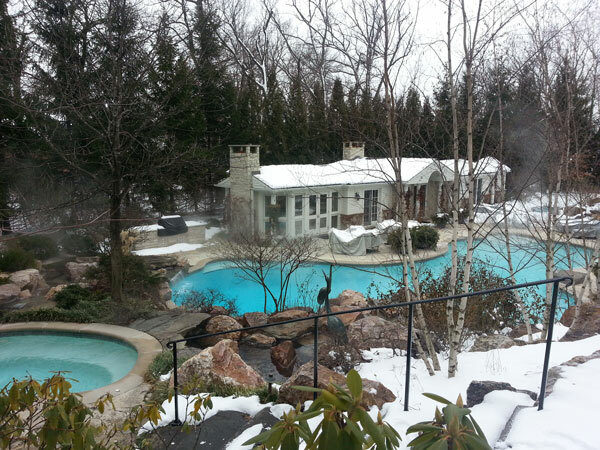 These photos are of a pool we designed in Northbrook, Illinois who’s owner enjoys throughout the cold Chicago winters! 1. Make sure your pool heater or heat pump is designed to work in cold conditions. Many heat pumps won’t be able to function below 50º, but certain ones that can be installed can work well into the 20’s. These “Hot Gas Defrost” units are sometimes known as “ice breakers” and can keep your pool water warm and ice free all winter long. This is true for the main pool as well as your spa or hot tub. 2. It’s more than just maintaining a comfotable temperature for swimming. Because the cold weather risks pipes freezing, you must leave the heater on at all times or else the pipes feeding the pool could freeze and cause expensive damage. You may also want to make sure to have a backup power source if you live in an area where winter storms can cause power outtages. 3. Make sure that the pool deck is designed to be shoveled easily. While the ambiant heat from the pool will keep the immediate edges of the pool free of ice and snow, the pathway from your house and pool house or cabana may be difficult to maintain unless you take into consideration materials that are easy to keep ice free. 4. Similarly, you will need to make sure that the materials used in construction are able to withstand the temperature differentials between the warm pool water and the cool air. If not, you will risk them cracking and potentially causing additional damage. 5. You may want to build your pool house close to the edge of the water so that it is only a short walk through the freezing air to get inside and warm up. Likewise, you will want to make sure to have plenty of space to take a hot shower and change before going back outside to walk to the main house. On the plus side though, by designing your pool to be open all winter you can avoid the delay caused by having to open the pool in the spring. Also, while there is standard maintenance throughout the winter, you will avoid the extensive spring cleaning since algea and water chemistry won’t have to be rebalanced after the long winter. Even on days where the air is too cold to enjoy the pool or spa, there is an aestic value of having your pool open in the winter. What would you rather look at in your back yard … a hole in the ground covered with a black cover or the steam rising from the beautiful blues and greens of your dream pool?